Do we have children because of instinct, obligation or something else? Shankar Vedantam in Slate provoked a virulent response when he suggested that parenting is an addiction where the brief moments of ecstasy from a child’s love overcome the many frustrations and compromises made to parent them. And yet no one knows the love of a child when we first consider having one. The commentary ranged from outcries over parents having more children then they can afford (although, in my opinion, unfairly criticizing only the mother’s for this behavior – and it does take two to tango) to religious beliefs to questions of feeling complete, one of the comments noted that every living thing on earth exists to procreate. I think it’s likely a mix of instinct, obligation and something else. But for us, choosing to have a child was a great expression of hope. Considering we had a huge mortgage and neither of us had jobs at the time we conceived, we were perhaps irresponsibly optimistic. But we had hope about our future and the future of the world. Our children are endless possibility as well as endless obligation. For some time following the birth of my first child, I wondered if my dreams were now relegated to history as I had to protect and provide for him. My conclusion is that my dreams adapted to include my family. 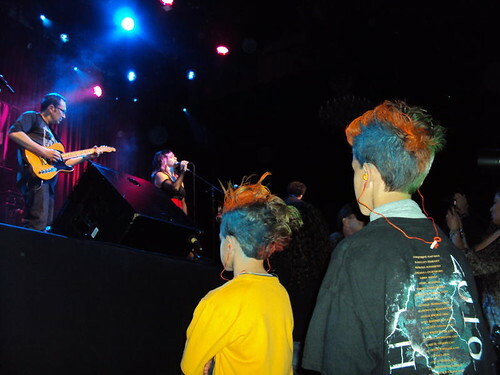 When I performed in a rock band at the Fillmore a few weeks ago, sharing it with my sons was possibly the very best part. A child is also a reminder that G-d or fate or the universe has a funny sense of humor. While they are full of possibilities, as a parent we have little sway over what possibilities our child will pursue. And their choices are often the source of frustration as well as wonder. For example, I’d like my eldest to love piano and he does like to play, but his heart calls him to the drums. And so that’s where he’ll focus. Many parents stress over the high schools, colleges and careers of their children – and none of us have a great deal of control over it anyway. As we strive to keep just one step behind our busy family, I find myself consciously trying to stop and codify the moments of bliss in my memory. Sure, there is a surge of happiness (oxytocin to be biological) when my children hug, kiss and say they love me. And if I don’t see them for a few evenings because of work and other commitments, I find myself stressed out – and just being with them is the remedy. Lately, I’ve found that participating in moments of wonder – writing a song, drawing a picture or launching a rocket – is another source of sustaining memories. I think these moments happen every day – and the challenge is to stay tuned in enough to notice them.